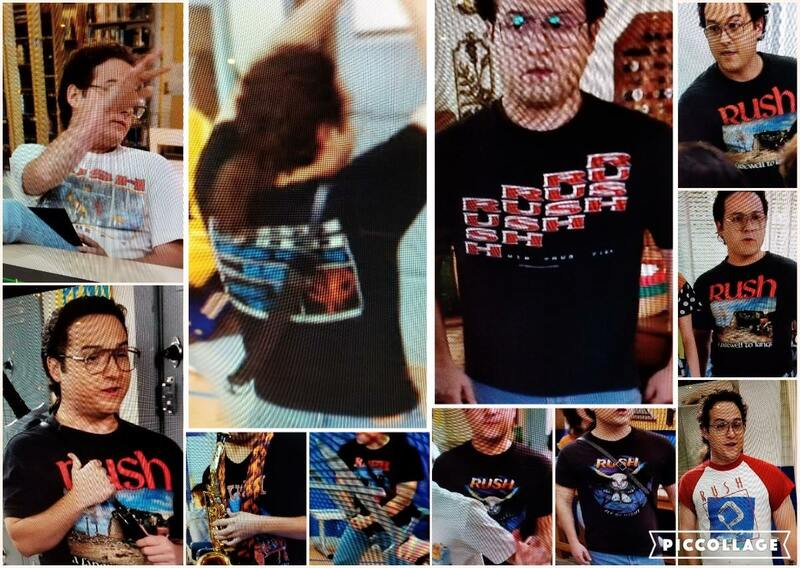 UPDATE - 2/22@2:46PM: Here's a nice montage photo of the 11 t-shirt sightings in the episode courtesy Dan D.
UPDATE - 2/21@3:17PM: After scanning the episode, Johnny doesn't actually wear 11 different Rush t-shirts in the episode, it's more like six (if you include the montage sequence shown at the beginning of the episode). However, the eleven might be referring to the number of times he showed up on screen with a Rush t-shirt; he was shown at different times wearing the same shirt. I spotted Hold Your Fire (2 different ones), Moving Pictures, A Farewell to Kings, Grace Under Pressure and Fly By Night. Actor Sean Marquette, who portrays Johnny Atkins, on the ABC-TV hit comedy The Goldbergs, steps into the Limelight in an upcoming episode of The Goldbergs, and will wear 11 different Rush concert T-shirts throughout the episode which airs on ABC-TV on Wednesday, February 20 at 8 p.m. The Goldbergs' executive producer Adam F. Goldberg often creates "totally surreal" moments in his show featuring life-long friends, heroes, idols, and other well-known celebrities from his personal life of growing up in a suburban Philadelphia neighborhood in the 1980s into his show. "Johnny Atkins is this sort of modern-day warrior with that mean, mean stride," said Goldberg. "His character is designed to be this rebel and a runner, a restless young romantic. He is based on a friend of mine from high school that was always wearing concert T-shirts whether it was in the high school halls or the shopping malls." 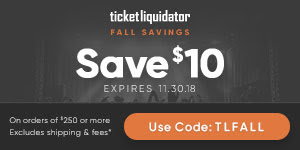 "I'm a huge Rush fan, and this is my way of always paying tribute to one of my favorite bands by having Johnny wear a Rush T-shirt in every episode," said Goldberg. 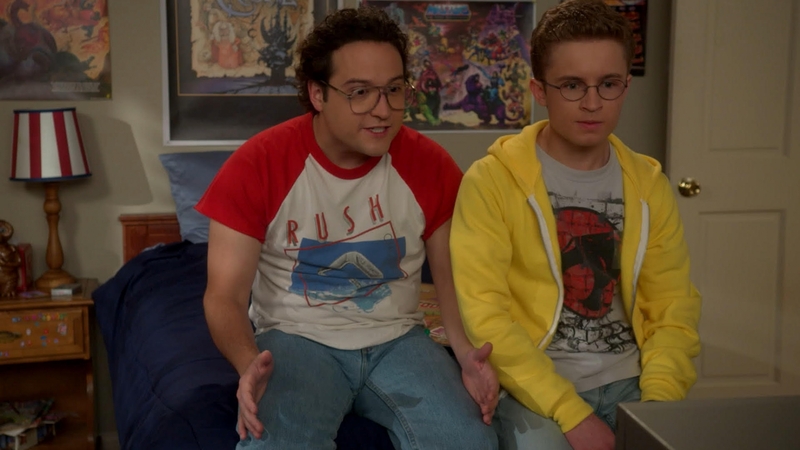 Marquette's character wears a Rush T-shirt in every episode he appears. He will also make a cameo appearance immediately following The Goldbergs episode on February 20 on the show's successful spinoff, Schooled, airing at 8:30 p.m. on ABC-TV, in a Rush T-shirt, of course. You can watch The Goldbergs on ABC or online at the ABC website here (or on Hulu).